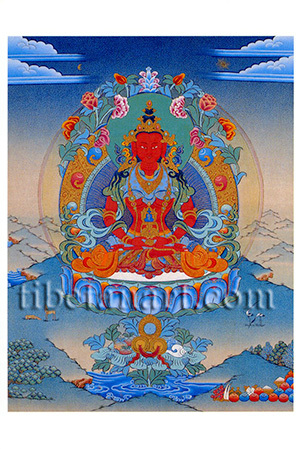 Amitayus is the sambhogakaya aspect of Amitabha Buddha and one of the three principal deities that are associated with long-life rituals and practices. Amitayus, meaning 'Infinite Life', is ruby-red or coral-red in colour and he sits in vajra-posture, with his hands resting upon his lap in the dhyana-mudra of meditation. Upon his open palms rests his attribute of a golden long-life vase that is filled with the nectar of immortal wisdom, which is sealed at its top with a small wish-granting tree, or a red jewel that bears his bija or seed-syllable HRIH. Amitayus is adorned with the five divine silk garments and eight jewelled ornaments, and he sits upon a white moon disc and a multicoloured lotus, with flowers adorning his golden aura. On either side of his throne are two deer and two cranes, which are both symbols of longevity. Arising from the lake in front of him are the offerings of the five senses; a mirror (sight), cymbals (sound), fruit (taste), a conch filled with perfume (smell), and a silk ribbon (touch). Amitayus is often represented in a trinity of long-life deities, along with the goddesses White Tara and Usnishavijaya.